Prototype: German Railroad, Inc. (DB AG) operational museum train built according to artwork of the Ludwig Railroad of 1835. The train looks as it did after being rebuilt from the museum fire of October 2005. Model: It can be operated with AC power, DC power, Marklin Digital, and Marklin Systems. There are 2 powerful, miniature can motors with bell-shaped armatures, mounted in the tender. 2 axles powered. The locomotive has 2 free-standing lanterns with maintenance-free LED's on the front. They will work in conventional operation and can be controlled digitally. The driving wheels do not have flanges, like the prototype. There is a special coupling between the locomotive and tender. The locomotive has a detailed platform for the engineer. The train has 3 passenger cars, The minimum radius for operation is 600 mm / 23-5/8. Train length 68 cm / 26-3/4. The train looks as the real life train currently does after being rebuilt. Prototypical detail changes to the locomotive and cars. The historic Adler passenger train is appearing in 2010 in a one-time series of 666 units on the occasion of the 175th anniversary of railroading in Germany. A consecutively number certificate is proof of the authenticity of this exclusive set. The first train in Germany ran on December 7, 1835 between the cities of Nurnberg and Furth. This rail line was only 7.45 kilometers / 4.66 miles. It became famous as the Ludwig Railroad and had its roots in a railroad project developed a few years earlier that was quite revolutionary for the times. The Privileged Ludwig Railroad Company was founded in November of 1833 and was granted a concession from the Bavarian King Ludwig I on February 19, 1834 to build and operate the railroad. Horses and a steam car were planned to be available for operation. Originally, the steam car was supposed to be built in Germany, but a reliable builder could not be found. Therefore, an order for the first German steam car was quickly placed with the father of the steam locomotive - George Stephenson in Newcastle upon Tyne, England. 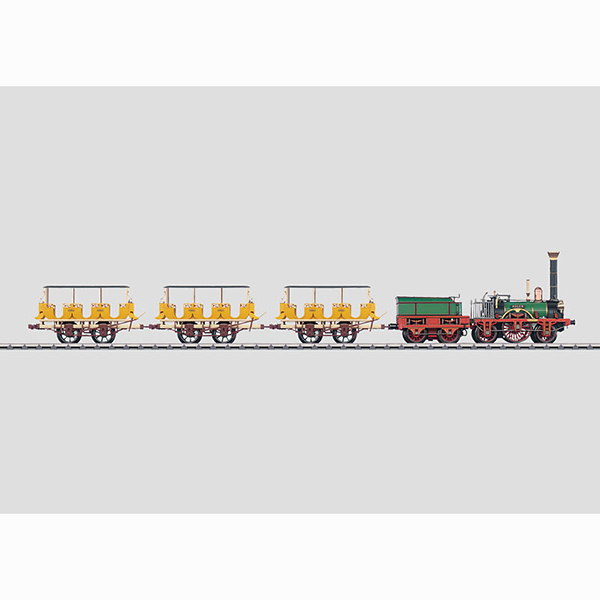 The order was not placed until May of 1835 and after an eight week, very arduous trip the new steam locomotive arrived in Nurnberg on October 26, 1835, but disassembled in over 100 pieces and packed in 19 large crates. The locomotive was immediately assembled under the expert direction of the English locomotive engineer William WiIson delivered with the locomotive. It was named after the Adler or Eagle as the heraldic animal of the Kaiser and the free imperial cities. The purchase of the cars was simpler. Two frames had been delivered from England, and the home industry built the car bodies as well as another seven passenger cars. The locomotive was built on a wood frame strengthened with sheet metal. Two inboard, vertical wet steam cylinders powered the driving axle located in the middle. The driving wheels had no flanges in order to enable the locomotive to negotiate sharp curves. The wheels were initially made of cast iron (later forged iron) and were surrounded with forged tires. The forged, hollow wheel spokes were given a wood core in order to cushion unevenness better. Braking was done with the help of a spindle brake, which only worked on the tender wheels on right side of the fireman. Initially, charcoal, then later hard coal was used as fuel. The approximately 6.5 metric ton Adler turned in excellent results right from the start. Its performance was around 40 horsepower and its speed when running by itself was 65 km/h / 40 mph. It could pull up to twelve cars. After 22 successful years of operation retirement caught up with it in 1857 and soon after that it was scrapped. Starting in 1933, the DRG had a reproduction built largely true to the original for the 100th anniversary of railroading in Germany in 1935. This was done at the maintenance facility in Kaiserslautern and included the cars to go with the locomotive. In addition to differences in technical data, the reproduction differed from the original chiefly in a thicker boiler wall for the sake of safety, additional transverse bracing, and spoke wheels made of steel. This was the steaming Adler reproduction at the one hundred year anniversary, 25 years later at the 125th anniversary, and, after being overhauled, the 150th anniversary of the first years of railroading in Germany. The operational reproduction of the Adler was heavily damaged, among other locomotives, in a fire at the museum depot in Nurnberg-Gostenhof on October 17, 2005. The DB's board of directors decided to restore it however. At least 80 percent of the original parts from 1935 could be used again for the restoration. In the process the new Adler became even closer to the prototype in details than the burned up locomotive. For example, the reconstruction of the smoke stack did not follow the reproduction of 1935 but was closer to the original. Only the two burned up cars built largely of wood had to be built completely from scratch. The new Adler as well as an old (1935) and two new (2007) passenger cars have been located since November 23, 2007 in a locomotive shed again close to the DB Museum in Nurnberg.